Random posts about trail running, computing, family-ing, thinking, and whatever else I choose to say. Today was my day to fly back home! Dariush and Nouchine picked me up at Bob and Michelle's house around 8:30 am and we headed toward the Dusseldorf International Airport. It was raining and cold; perfect weather for my departure (remember). We stopped at a great little restaurant and had a nice hearty European breakfast. 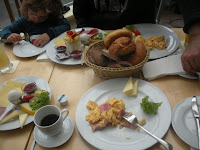 Breakfast consisted of a heap of scrambled eggs, meats, breads, yogurts, fruits and veggies. 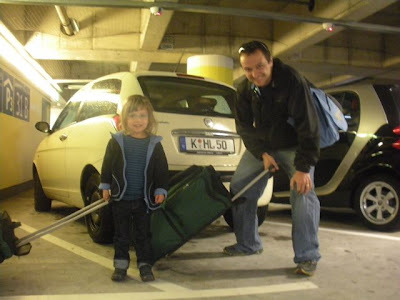 After we all gorged and had a few laughs, we headed to the airport which was only about 10 minutes away. Dariush helped me get checked in and saw to it that I made it through security before he and Nouchine headed back to Cologne. Fast forward 8 hours (no sleep). I landed in Chicago and had a 4 hour layover. Talk about maddening!! I was so close to home, but had to sit around and watch the clock tick by before the quick little flight back to my girls. 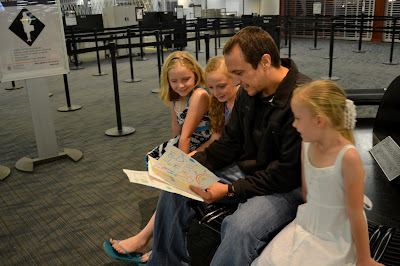 Finally, I made it home to Jennifer, Lizzie, Jazzy and Daizi @ the Columbus Airport. My plane landed a little before 9:30 pm, which was about 3:30 am by my internal clock. The reunion was AWESOME! The girls met me at the gate and gave me a huge family hug. Each of them made me a 'Welcome Home' card and I read each of them with 100% of my full attention. They had so much detail in them and I simply loved them. We left the airport and headed for the CheeseCake Factory @ Easton. I was so happy to be home!! - DNF @ 38 miles! I'm a software developer, a trail running addict, a father of 3, a drummer, a country boy, and a very lucky husband. Yes, I still hacky sack! Picture Window theme. Theme images by kevinruss. Powered by Blogger.